On Monday, November 13, 2017, the National Law School Veterans Clinic Consortium (NLSVCC), the American Bar Association (ABA), and the Veterans Consortium Pro Bono Program (TVC), signed a Memorandum of Agreement (MOA) with the U.S. Department of Veterans Affairs (VA). This innovative agreement is a joint mission to improve access to legal resources for veterans and their families, increase the number of free legal clinics, including law school veteran clinics, and expand the number of VA hosted medical legal partnerships (MLP). The MOA specifically addresses the need to: (1) establish regularly held free legal clinics in all VA medical centers; (2) improve access to legal services for veterans in rural areas; (3) increase the number of law school clinics serving veterans; (4) encourage VA collaboration with MLPs and law school clinics to address veterans’ medical needs in relation to legal problems; and (5) engage in partnerships with law schools and community organizations to improve the quality of the resources provided. 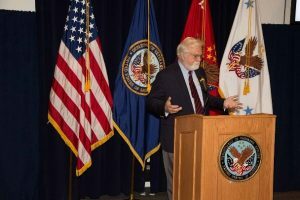 The signing event featured remarks from VA Deputy Secretary Thomas G. Bowman, VA General Counsel Jim Byrne, and the signatory organizations. NLSVCC Board Member Edwin J. Olsen, MD, JD, MBA, signed on behalf of the NLSVCC, and NLSVCC’s pro bono counsel, Chris DeLacy and Doug Dziak, from Holland & Knight attended the ceremony. Photo of NLSVCC’s Dr. Olsen giving remarks, which included reference to the late Bill Russo, long-term VA employee and tremendous supporter of law clinics serving veterans. ; host national conferences to train others how to provide pro bono legal services to veterans (next scheduled for spring 2018); and share best practices among members and community partners such as the VA, the ABA and TVC. If you are interested in learning more about NLSVCC, becoming a member, or making a donation, please visit www.nlsvcc.org. For more information about this memorandum, and NLSVCC’s work, contact Patty Roberts at perobe@wm.edu or Stacey-Rae Simcox at ssimcox@law.stetson.edu.